In your company's payroll tasks, you may occasionally have an employee who wants to claim exemption from withholding. Here is the information on exemptions from withholding and a guide to help you deal with this issue. For the current year, they expect a refund of all federal income tax withheld because they expect to have no tax liability. Some types of employees may be exempt: students, part-time workers, those over 65, and blind employees. As you can see, a withholding exemption is only good for one year. It must be claimed each year, and it must be claimed by February 15. After February 15, you can't accept a claim of withholding exemption. The employee would have to wait for the following year to claim the exemption. The main thing to remember in this situation is that you can only change withholding based on the documentation the employee gives you. Until the employee gives you the correct form or forms, you must continue to withhold federal, state, and local income taxes based on the most recent forms completed by the employee. You can't take the employee's word on the claim of exemption. To claim exemption from withholding, the employee must complete a new W-4 form by February 15 of each year to change withholding. The W-4 form includes information on the employee's marital status and the number of allowances claimed, in order to calculate withholding. Line 7 - The claim of exemption - will show the word "Exempt." A claim of exemption from withholding does not exempt the employee from paying their share of FICA taxes, including the additional Medicare tax. All FICA taxes must be paid by both you as the employer and by the employee. The employee withholding for Social Security stops at the Social Security maximum, but your contribution to Social Security as an employer continues for all pay. The claim of exemption for federal income taxes has nothing to do with the employee's state income tax and local tax withholding. The employee will have to check with state and local taxing agencies to find out how this exemption works in those jurisdictions. As noted above, until the employee gives you the signed documents for the claim of exemption from state or local taxes, you must continue to withhold these taxes. If the employee wants to claim exemption from withholding but they have already had withholding taken from their pay during the year, you can't refund them this money. At tax time, you will notify the employee of the withholding on the​ W-2 form for the year. The employee can then claim the withholding. For example, Carlton comes to you in February and says he wants to claim exemption from withholding for this year. He completes a new W-4 form, but you have already withheld $276 from his pay in January. He'll have to wait to file his tax return and claim the $276. Don't assume that a student, part-time worker, or seasonal worker is going to be exempt from withholding. All employees must complete a W-4 form at hire, and this form is what the employee must use to claim an exemption. Your attorney will tell you not to help employees complete forms. But if an employee asks you can give them information to help them make the decision on their own. IRS Publication 505 has a flow chart that might help the employee decide to claim exemption from withholding. If you think an employee's W-4 withholding exemption is incorrect, you can't change it, but you can advise the employee that the exemption may be questioned by the IRS. No matter what the employee claims, you must use only the signed W-4 form to withhold from employee pay. 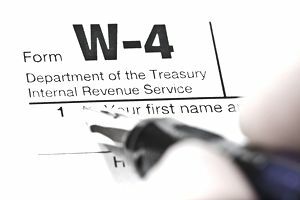 You don't have to turn in W-4 forms to the IRS, but they can review an employee's claim for exemption and they can ask you to submit an employee's W-4 form. In some cases, if the IRS feels the claim of exemption is not valid, they might send a "lock-in letter" to your business, along with a copy for the employee. A lock-in letter locks in the employee's withholding based on the IRS review. This letter specifies the maximum number of withholding allowances permitted for the employee. Once you receive this lock-in letter, you must begin using this information to withhold federal income taxes from the employee's pay, effective with the date set by the IRS. You can't change the withholding amount until you receive permission from the IRS; you can't accept a new W-4 from the employee to change the withholding amount. If you don't change the employee's withholding based on the withholding in the lock-in letter, your business is liable for paying the additional amount of tax that should have been withheld.